This year’s winner in the Best Mobile Serious Game category of the Serious Games Showcase & Challenge, U.S. Army STARS: Elements is an innovative free application for high school chemistry teachers to help their students learn the foundations of chemistry in a fun way. Developed by Army Game Studio, the Serious Game is available for iOS, Android and WebGL capable browsers. Through interactive models and challenges players can build their own atom, play a game to learn about chemical bonds, explore the periodic table, and test their chemistry knowledge. In addition, easy to use lesson plans and teacher guides are available at http://usarmystars.com/lessons to help integrate STARS: Elements into the classroom. The Army partnered with several school systems in the development of this application including Madison County Alabama High Schools and Tennessee Tech University. Through these partners, they have been able to test the Serious Game with the target audience and have received very positive feedback from both the students and the teachers. STARS: Elements offers four main areas to explore - Periodic Table, Atom Builder, STARS Challenge and SmashBond. 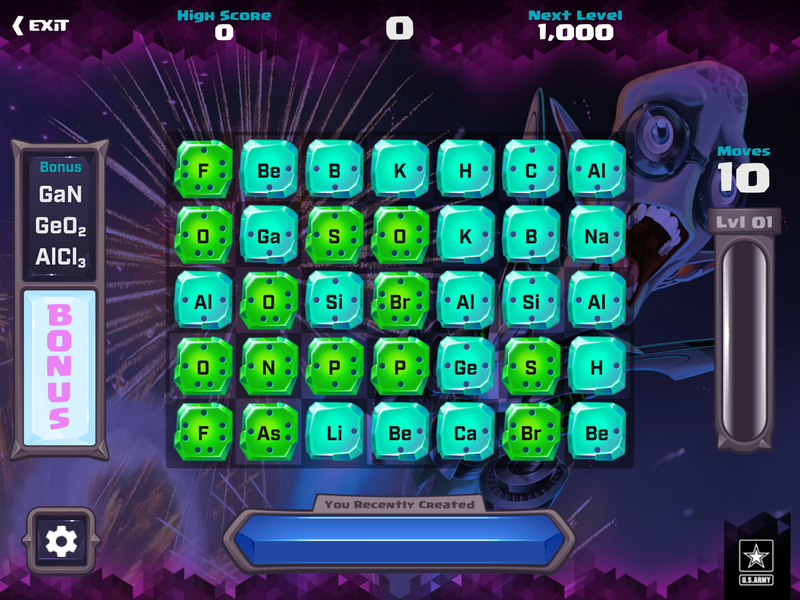 In short, the Periodic Table feature shows the interactive periodic table and information about each of the elements; the Atom Builder feature presents the atomic structures of the elements; STARS Challenge reviews the players’ knowledge of elements and bonding; and the SmashBond game teaches basic molecular bonding based on the Octet Rule by creating ionic and covalent bonds. Please find below further details for each area. STARS: Elements provides a fully Interactive Periodic Table listing of all known elements. Initially, only the element’s atomic number and symbol are displayed. However, hovering over an element pops up a field displaying the element's full name, atomic number and properties. 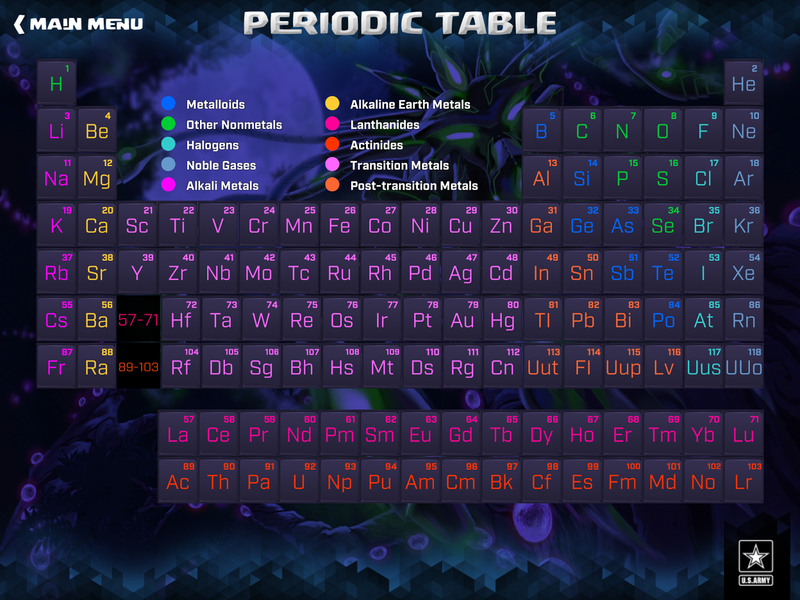 The interactive Periodic Table presents each Element Name, Atomic Number, Atomic Radius, Ionization, Electron Affinity, and Electronegativity. 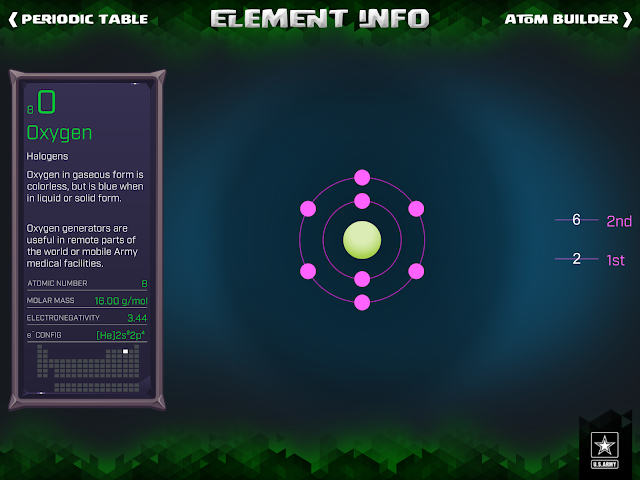 Other information related to the element is contained within the Element Info that includes a variety of facts and attributes of the element along with the element's Bohr model. The electron shells and the nucleus of the model may be selected to highlight additional information. Selecting from the list of electron energy levels allows the student to view the specific number of electrons in that energy shell. 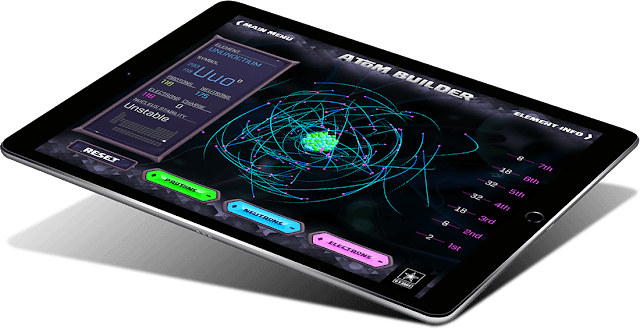 The Atom Builder is a model where the student can create and manipulate atoms within a 3D environment for purposes of exploration, discovery, and learning. It is intended to reinforce and help visualize the particulate nature of matter. Students are free to add/subtract protons, electrons, and neutrons as desired. 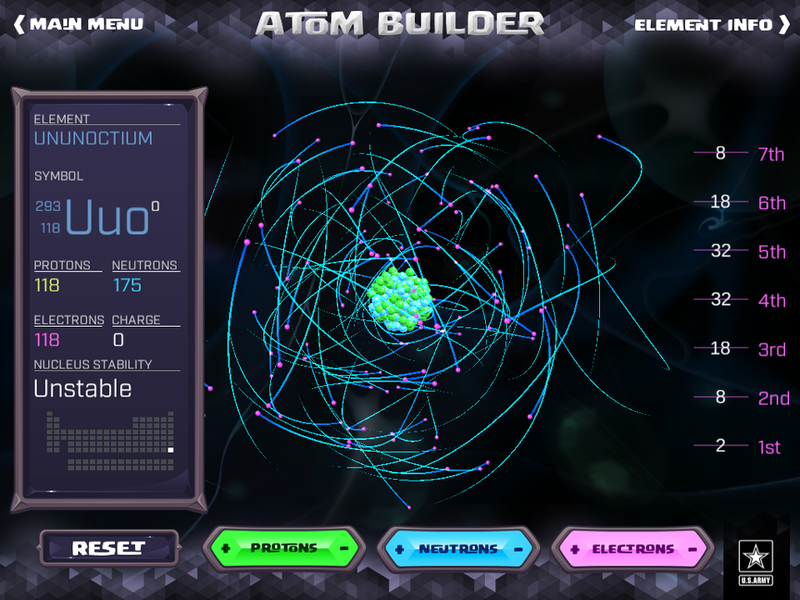 As protons are added or removed the element changes as appropriate. If an ion or isotope is generated, this is indicated; also, the generated atom is identified as stable or unstable, based on nucleus stability. 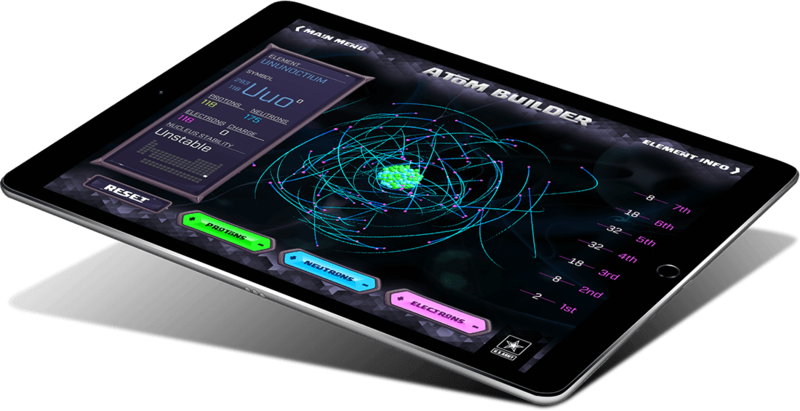 Students can create elements in real time by adding and subtracting neutrons, electrons, and protons. The students discover the relationship between the composition of the elements through these subatomic particles. 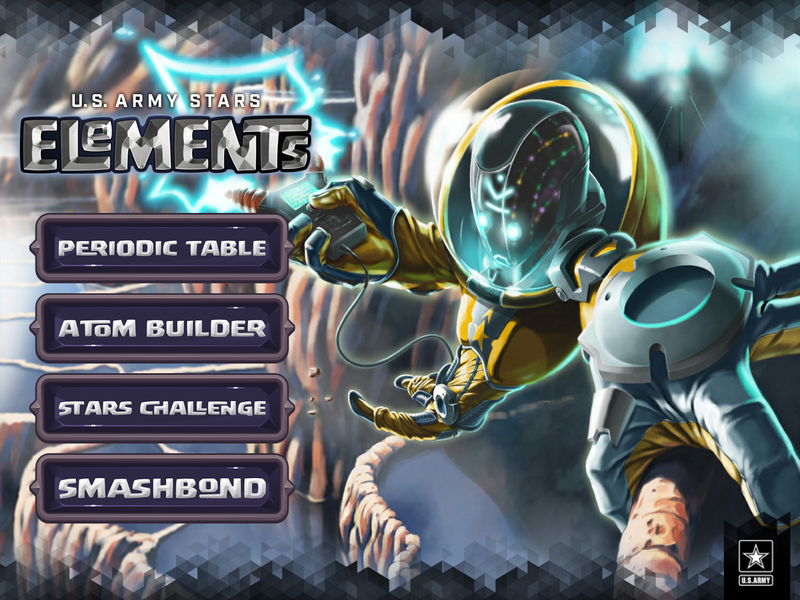 The developers consider the SmashBond game design the most innovative aspect of the app because the learning objective is a byproduct of the gameplay itself. In the SmashBond game, students are challenged to combine elements on a grid in such a way that each atom has eight electrons in its valence shell (or in the case of hydrogen, only 2!). This matching style game is designed to help students learn the fundamentals of how elements bond to create compounds based on the octet rule and Lewis dot structure. 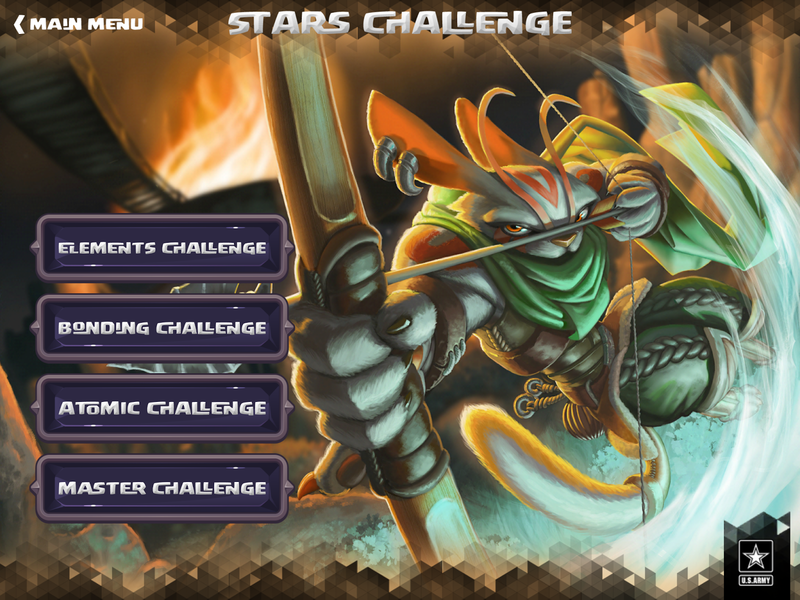 The STARS Challenge allows students to test themselves on what they've learned from using the STARS: Elements app. In this collection of challenges, students are presented with 10 exercises/questions on the three categories of knowledge referenced in the app (Periodic Table, Atomic Structure, and Bonding). U.S. Army STARS: Elements is part of the Army’s commitment to maintaining the American youth well versed in the STEM fields.